A-HOTEL.com - Luxury and cheap accommodation in Dzhubka, Russia. Prices and hotel, apartment booking in Dzhubka and surrounding. This hotel lies in the heart of Dzhubga village, only a 5-minute walk from the Black Sea coast. An outdoor swimming pool and a 24-hour font desk are featured at Idillia Hotel. This hotel is located in the centre of Dzhubga, a 7-minute walk from the Black Sea coast. An outdoor pool, free Wi-Fi and free parking are provided at Prestige-Maras Hotel. 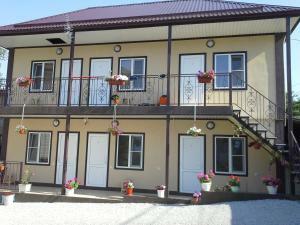 Hotel Arkadia is located in Dzhubga and has barbecue facilities and a garden. Among the various facilities are a terrace, a shared lounge, as well as a bar. Chernomorskaya Loza Guesthouse offers air-conditioned rooms in Dzhubga. Featuring a 24-hour front desk, this property also provides guests with a barbecue. Островок features free WiFi and rooms with air conditioning in Dzhubga. Among the various facilities of this property are a garden and a shared lounge. Boasting barbecue facilities, Guest house Izumrud is located in Dzhubga. Featuring a shared kitchen, this property also provides guests with a terrace. Guest House Paprika is set in Dzhubga and features a terrace and a shared lounge. Both private parking and free WiFi are available at this property. Located in Dzhubga, Mari & Milen has a seasonal outdoor swimming pool. The property features barbecue facilities, as well as a garden. Аравана features barbecue facilities and a garden in Dzhubga. Featuring a 24-hour front desk, this property also provides guests with a children's playground. Situated in Dzhubga in the Krasnodar Krai region, Apartment Polevaya 19 has a balcony. The property features mountain views. Boasting barbecue facilities and free WiFi, Долина Ветров is located in Dzhubga. Guests can enjoy mountain views. Featuring air-conditioned accommodation with a balcony, Квартира is situated in Dzhubga. Guests have access to free WiFi. U Natalii Guest House in Dzhubga features barbecue facilities and a garden. Featuring a shared kitchen, this property also provides guests with a children's playground. Featuring an outdoor swimming pool, Guest House Parus is situated in Dzhubga. Among the various facilities of this property are barbecue facilities and a garden. Featuring free WiFi and a garden, Prichal 38 offers pet-friendly accommodation in Dzhubga, within a 5-minute walk of the Black Sea coast. Free private parking is available on site. Situated in Dzhubga, Guest House on Solnechnyy 6B features barbecue facilities and free WiFi. Among the various facilities are a garden and a terrace. Situated in Dzhubga, Oleniy Ruchey Guest House has barbecue facilities and a garden. Among the various facilities are a terrace and a shared lounge. Situated in Dzhubga in the Krasnodar Region, a 15-minute walk from the coast of the Black Sea, U Reki boasts a barbecue and terrace. Free private parking is available on site. Pansionat Dzhubga offers rooms in Dzhubga. Among the various facilities are a private beach area and a garden. Guest House Tatiana is situated in Dzhubga, a 3-minute walk of the Black Sea coast and a water park. Free private parking is available on site.